This legendary pale Pilsen lager has become a legend amongst beers, and has created a completely new category of beer (Pils, Pilsner). Neither the recipe nor the brewing process has changed since it was first made in 1842. 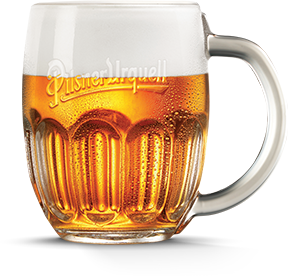 The skill of the Pilsen brewers has meant that its quality and flavour have stayed the same, too. This is proven by regular laboratory comparisons, the oldest of which dates back to 1897. The secret behind the flavour of this legendary bottom-fermented lager, containing 4.4 % alcohol, lies primarily in the high-quality ingredients that are used to brew it. its characteristic aroma of malted grains and balanced caramel flavour are the result of the triple mashing process; soft Pilsen water gives it its unique mild taste, while that velvety bitterness comes from Žatec hops. It is the malt itself that gives the beer its familiar golden colour.